We had received news of his passing weeks earlier from their small village further North in Mozambique. Young and healthy, his death came as a sudden shock and surprise. The news rocked us and brought us to tears over and over again-but nothing could have prepared us for seeing his family again. An incredible missionary family that served for years on the field and spreading God's unwavering love wherever they went. 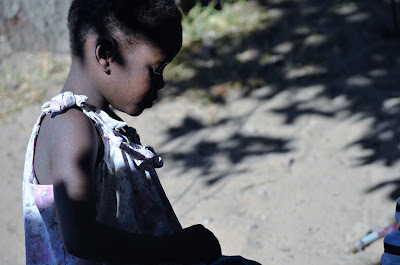 When they got off the bus with their many suitcases carrying the last of their worldly possessions and memories of Mozambique, you could see the tiredness after many sleepless night and painful loss in his widow's face as she began to tear up once again. I wondered briefly whether I was supposed to maintain a strong encouraging front or utter compassion for the loss and despair before tears started streaming uncontrollably down my face. I truly can not even begin to fathom the harsh realities that lie before their family having just lost their father, best friend, husband, and so much more. Their young children, two under the age of seven, a pre-teen and a teenager continue to inspire me. Their smiles, their playfulness, their laughter, their ability to look out and care for one another in good times and bad is truly remarkable. They walk out a faith far beyond their years in their simple everyday actions. I'll never forget her words. I don't understand God's ways. I don't understand why sometimes we pray, people are healed and other times we pray and people die. I have so many unanswered questions. And yet through it all, I know that God is good and that He is faithful even when we can't see His purposes in it all. My hope and prayer for my friend's children, for myself, and for anyone reading this, that in good times and in bad, in joy and in despair, in times of gain and in times of utter loss, that we too, would never loose our faith. Totally inspiring. Those kind of Christian make a difference in peoples lives. May God add them evento more faith to their lives.